I don’t recognize this house! 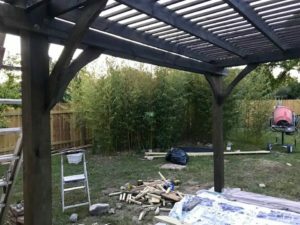 Since our last update, we have more pergola progress to share. This addition will be worth way more than it cost to build, and stained dark like this, it really looks wonderful. There are lovely details on the pergola structure. Can’t wait to see plants hanging from it! Carol’s pictures show that we replaced the fence on two sides of the house, and have trimmed up the back yard plants, yet left lots of interesting greenery to enjoy while sitting on the patio in the shade. The front of the house is gorgeous, too, so I’m glad Carol took a picture of the whole thing. The porch is just so nice, and the big corner tree is a real asset. 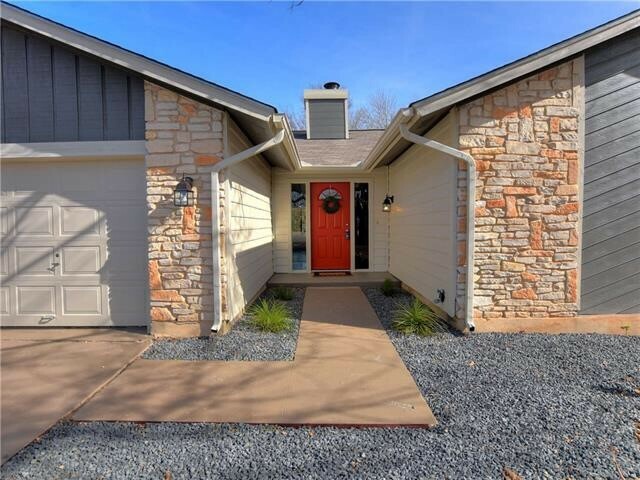 Did you know this house has a great inside, too? The master bedroom is HUGE, and the secondary bedrooms are a great size. 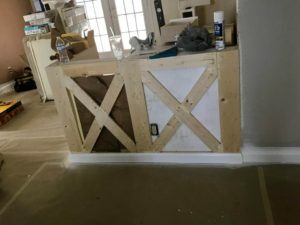 Look forward to more images of those parts of the house. 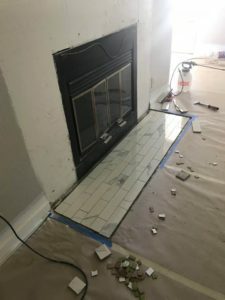 The old fireplace has a bright new tile area. Carol paid a visit to Russet Valley over the weekend to check on the progress of that project. 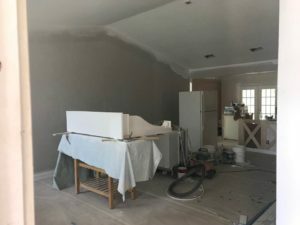 For the most part, things are moving along at a brisk pace, which makes the house look less and less like its former self. Here you see the newly painted mantel, as well as the new wall color. Inside the house, Carol has had the tile replacesby the fireplace hearth, so it is now a modern marble. The formerly brown mantelpiece is now white as snow. I can’t wait to see what it looks like when it’s replaced on the wall. Also on the inside, the rustic feature on the kitchen peninsula has progressed, so that the X feature repeats. It will look really warm and interesting when it’s conmplete. What a lovely entry the bricks make! 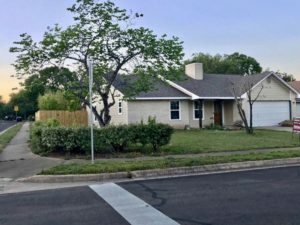 The main problem with the outdoors is that the front yard tree that got trimmed hasn’t come back from its trimming. It looks like a new tree is in the future, darn it. There’s more that could be done with landscaping, and that’s for Lee and Carol to work out. The front porch, however, is a happy story. 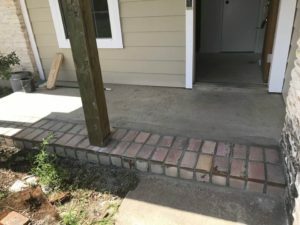 The recycled bricks look just wonderful on the expanded porch area, and the wood-covered accents will be great when stained. Just those few more inches of space will make the area easier to use for sitting and waving at the neighbors. That is a nice, big patio area, ready for entertaining. Then, wow, let’s go to the back! 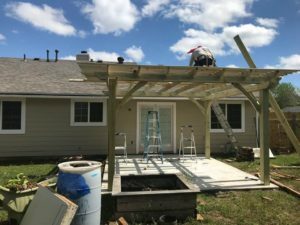 Check out that pergola! 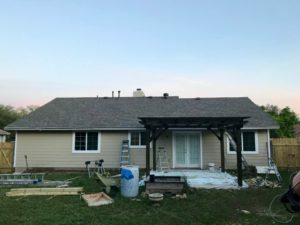 Since there really wasn’t much of a back patio at all before, this will add so much value and living space to the house, in addition to shading the back and lowering elecricity costs. 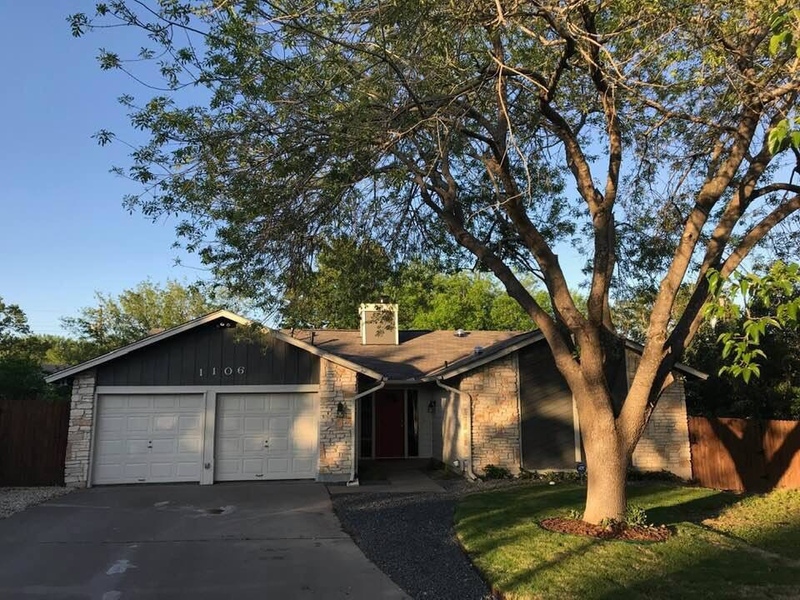 Buyers will love it! Carol says it’s finished now and ready to be inspected. The back yard, which already has a pond, will be a retreat for anyone. Photos courtesy of Carol Mangum. 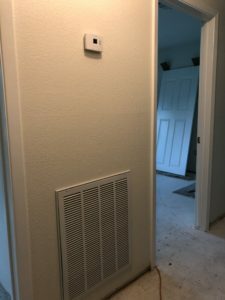 Even a simple new grate makes the house look so much better. 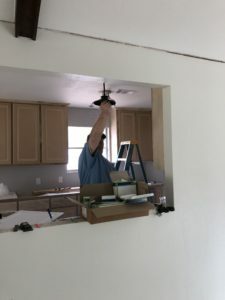 In this week’s visit to the Washington house, Mandi and I showed up in time to meet the electrician who’s fixing up all the outlets, light switches, etc., and installing the light fixtures. James had hoped to have some fixtures up for us to take photos of, but instead had spent some time fixing some iffy wiring. We’d rather he did that anyway! While we were looking the nice new covers over, James had some questions. They were all really good ones, so I was glad to have the opportunity to address them. First, we found out that the two closets with light fixtures did not have light switches. That makes the ights we picked out for the spaces not work at all! He recommended some simple pull chain ones instead, which makes ssense. They’re just closets. James Smith demonstrates what the pendant lights in the kitchen will look like from the living area. Next he told us the spare can lights we had were too big for the allotted space in the kitchen. He wondered why we hadn’t chosen to get more of the kind we’d chosen for over the sink, and we explained we thought it would look weird. He said the shadows cast by the can lights would also look weird. We decided that if the pendants were installed at the right height, they would look much better. Conveniently, the fixture comes with the right size header, as James demonstrates in the photo.